You might want to mention fiscal idiocy too. Price controls, high consumer subsidies, and with both central and state governments running deficits (not less than 8% of GDP combined over the last 5 years). The current account’s in deficit too, for the last 8 years. The twin deficits definitely suggest too high NGDP growth. I think the RBI knows this, but they’ve had to keep the spigots on because the financial system is rickety. There have been recurrent liqudity crunches since the Great Recession. I’ve been a Rupee bear for six years now – sad to see it come to fruition. I very much agree that the twin deficit indicates that NGDP growth has been excessive. Capital and currency controls in India are likely also important here. Needless to say they should be scrapped as well. I also agree with the worries over the state of the financial system, but there is little monetary policy can do about that other than to provide nominal stability. I generally agree with your bearish view on the rupee. 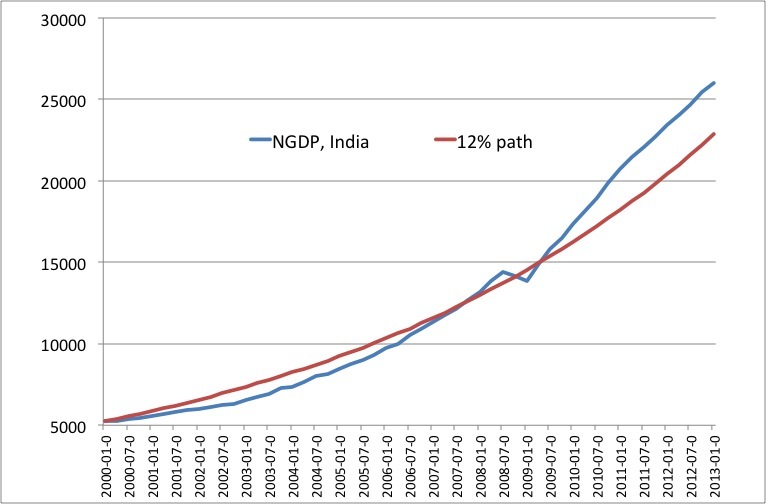 However, if a 8% NGDP target was implemented it would very likely be supportive for the rupee. I think it’s easier said than done to let the rupee float absolutely freely. India is a macroeconomic and structural disaster in theory. Investor sentiment is more herd-like than anywhere else and the composition of the trade balance is a clear indicator of what trouble a fast-sliding currency can lead to. With shifting global sentiment and hot money flowing out, a rupee in free-fall would have drastic balance sheet effects on corporates with dollar liabilities. There’s a clear trade-off here, but swinging one way or the other with monetary policy, in this exceptional case, might just be the wrong thing to do.